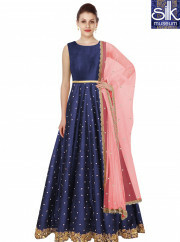 Be your exclusive style diva with this teal fancy fabric floor length anarkali suit. This pretty dress is showing some brilliant embroidery done with embroidered, lace and resham work. Comes with matching bottom and dupatta.